Financial Times Weekend Magazine, February 9/10 2013. Last May, I took a holiday with my family in Norway. On our first day, we went on a hike that took us up a steep mountain path to what had once been a farm. A few goats and sheep had been brought to graze but the outbuildings were deserted and the barn now housed a small café. A woman made cocoa for the children and tea for us. The next day, we decided to hike further up the mountain to a waterfall. It was not a particularly good day for a hike; it had rained all night and the sky was lined with heavy clouds. The footpath was slippery; not dangerous, but requiring care. A number of roughly carved walking sticks had been left by the gate for hikers to use, and the children spent some time choosing their favourites. We were united – as we so rarely are in our everyday life – by our sense of purpose; all quite happy to be walking up the mountain together. The children – they were six and nine years old at the time – were proud to be able to climb so high. Rounding a bend, we came to a small clearing; we took it in turns to lie down in the grass and drink from a stream. Throughout our walk, we had been accompanied by the sound of water running down the mountain as the snows melted. As we approached our destination, this sound became a roar. 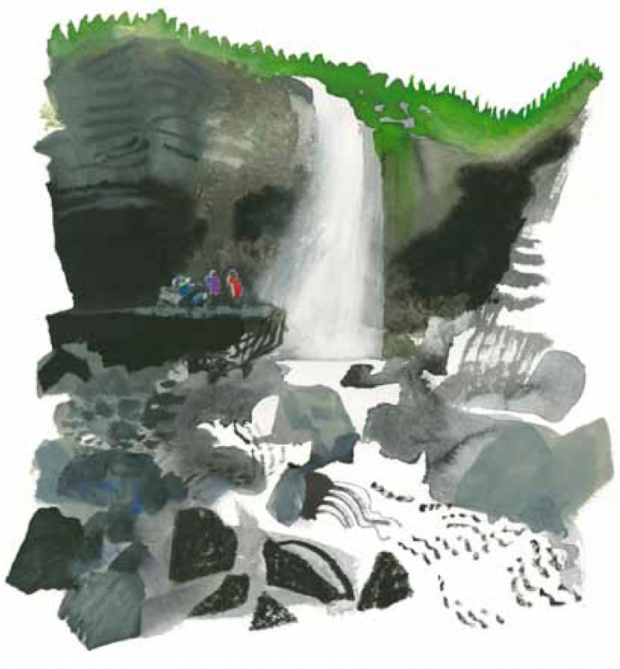 The waterfall was beautiful and we were glad to have reached it – how far we’d come. Sitting on a large flat rock near the falls, we looked at the map, ate Ritz crackers, and took turns taking photos. A few hundred metres above us, the mountains were still buried under snow; the Geirangerfjord stretched below us. My wife and I were struck by the panorama, and the children were too, though they preferred to keep their focus small. My daughter crouched down to pick a flower shaped like a bell, while my son filled his pockets with stones. As we made our way back down the mountain, I found myself thinking about the way time was passing – how strange it was to perceive the day unfolding in the expanse of nature, away from my usual routines, and away from other people. I was thinking too about the orderly passing of time in the course of my work. Most weeks, I see the same patient four or five times, often at the same time of day, in the same room, for a set duration. The repetition in this schedule tends to reveal certain small repetitive behaviours in my patients. One patient always arrives a few minutes late. Another never closes the door to my consulting room when she leaves. Another lies down on the couch and cracks his knuckles before speaking. One patient comes into the consulting room and, no matter how quickly or slowly I move to my chair, always sits down on the couch at the exact moment that I sit down; this woman was, for many years, a dancer, a ballerina in the corps de ballet. What does this mean? Why would she still wish to synchronise her movements to another’s? What is astonishing about each of these repetitions is that they would be impossible to carry out intentionally. If you resolved always to come to your session a few minutes late you would, of course, fail from time to time – it would be a struggle. But for the unconscious it is not. For the psychoanalyst, these habits can be meaningful. The patient who is always a few minutes late, for example, would find it uncomfortable to be early and to sit in the waiting room before his session – he is avoiding feelings of exclusion. The ballerina? She seemed to feel more comfortable, safer, if we were doing the same thing at the same time; it seemed to mean to her that our thoughts were in harmony too. We all have an investment in these habits of mind. Habit, as Proust pointed out, is “that second nature which prevents us from knowing the first”. Our small repetitive behaviours might give us a sense of dominion, a feeling that we are in charge of time rather than being swept along in it – protecting us from the experience of time passing, with its feelings of change and loss. Then I looked up, and saw that I had fallen behind. My family were now some way down the footpath, and had almost reached the farm. It was odd to watch them like this, together, but from a distance; my wife in front making sure that no one fell, my son trying to walk along the edge of the path, and my daughter, not putting a foot wrong. Then I was overtaken by the thought: this is how it will be. They’ll go on without you; you’ll have to let them walk on ahead. It will be like this. You’ll be OK – and they will too. In the consulting room, I’m so focused on details, on the singular aspects of each patient’s life – there in the mountains, where time is amplified, I felt the connections across the generations. I felt momentarily sad – but not depressed – and then acceptance, happiness.